The 3 Rs, Reduce, Reuse, Recycle, have become a mantra – an axiom with extraordinary reach across communities, cultures and nations for the more efficient use of natural resources, primarily by reducing waste. It is a leading example of the power of slogan and motif – communications and marketing – to change environmental behaviour. 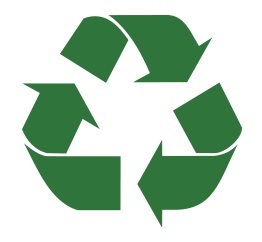 Reduce, Reuse, Recycle, also called the waste hierarchy, originated during World War II when shortages of raw materials motivated more conservative resource use, especially of metals, rubber, and wood as timber and paper. The concept developed after the war to sustain economies with on-going shortages. A failure in the supply of raw materials to any part of the manufacture chain, even temporarily, spelt doom for companies and the shocks would be felt through the economy. Thus, Reduce, Reuse, Recycle was a tool for economic stabilisation. It should not surprise us, therefore, that there is a growing consensus between environmental and economic (business) interests – deterioration in the quality and quantity of resources affects us all. Conflicts between environmental and economic interests are a luxury of communities with plenty, or the folly of communities with delusions of plenty. 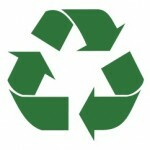 Reduce, Reuse, Recycle was adopted by the environmental movement during the 1970s as a way to reduce waste that would otherwise pollute. In recent years the concept has also been applied by businesses to improve profitability. Waste is costly to dispose or recover. There is also market risk and opportunity to businesses whose brands’ value may be tarnished by environmental impact or enhanced by environmental stewardship. The axiom came to be symbolised and globally recognised by the Mobius loop – a motif designed by Gary Anderson, a 23-year-old-college student. Gary’s account of his experience is available from The Financial Times. His was the winning entry for an art contest sponsored by a Chicago-based recycled paperboard company to raise environmental awareness amongst high schools and colleges across the USA. The motif ranks today with other international commercial brands for ubiquity and recognition but Gary earned just a couple of thousand dollars for his design. 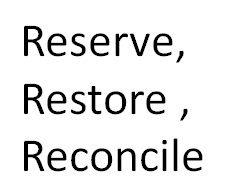 In applied ecological science there are another three Rs with much greater environmental value: reservation, restoration, and reconciliation ecology. These are not yet united by a slogan and they do not yet have their own motif. Nevertheless, their recognition as complementary applications of ecological science to environmental stewardship needs development and wider recognition. Unfortunately, reserved, restored and reconciled habitats, and their advocates, are too often regarded in opposition. In a future post I will introduce the concepts of reservation, restoration and reconciliation ecology and argue that we need to integrate them better towards resilient landscapes that sustain biodiversity and natural resources.